Careers in astronomy for women (as in other sciences) were a rarity in Britain and Ireland until well into the twentieth century. 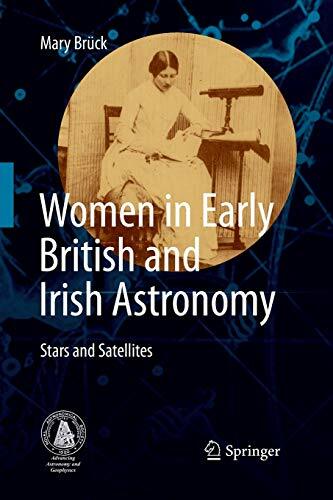 The book investigates the place of women in astronomy before that era, recounted in the form of biographies of about 25 women born between 1650 and 1900 who in varying capacities contributed to its progress during the eighteenth, nineteenth and early twentieth centuries. There are some famous names among them whose biographies have been written before now, there are others who have received less than their due recognition while many more occupied inconspicuous and sometimes thankless places as assistants to male family members. All deserve to be remembered as interesting individuals in an earlier opportunity-poor age. Placed in roughly chronological order, their lives constitute a sample thread in the story of female entry into the male world of science. The book is aimed at astronomers, amateur astronomers, historians of science, and promoters of women in science, but being written in non-technical language it is intended to be of interest also to educated readers generally.